Imagine that when you try and stand up again, you CAN'T! Well, that is what happened to Elina Sinisalo, the co-writer of the book "How Yin Yoga Healed My Student's Knee." As a masssage therapist she tried everything she could, but nothing worked. In a Thai Massage Training course, held in Leipzig, Germany with Gabe, of 'GabeYoga' she was surprised when he suggested her pain was due to lack of hip flexibilty. He showed her few poses to be held for a few minutes and claimed she will recover in less than 30 days. But she practiced the poses daily. It was a shock when one day, about two weeks after she started practicing the poses, she could do the pose that "hurt" her knee with no pain. She emailed Gabe right away. He explained that these were Yin Poses and suggested they write a book together. - What is the Yin Yoga and How it started in the late 1980s. - How to sequence Yin Poses to help relieve pain in the knee, hip or low back. - Insightful humor that will keep that smile on your face all day. If you are looking for a book that helps you to easily and quickly understand Yin Yoga and how to implement it into your life or your classes, this is the book you are looking for! This Yin Book reveals how correct target sequencing can help release pain and tension for the knees, hips, and low back. Yin yoga is a magical practice, but it is in the way the poses are sequenced that the body an either heal or just experience yoga poses. Based on an experience of a massage therapist who thought she knew her body, yet after talking to Gabe (founder of GabeYogAcademy) she did not trust his assessment of why her knee had problems. She did practice the sequence he suggested, and a few weeks later she wrote him how she could do the poses her knee would scream in pain before. 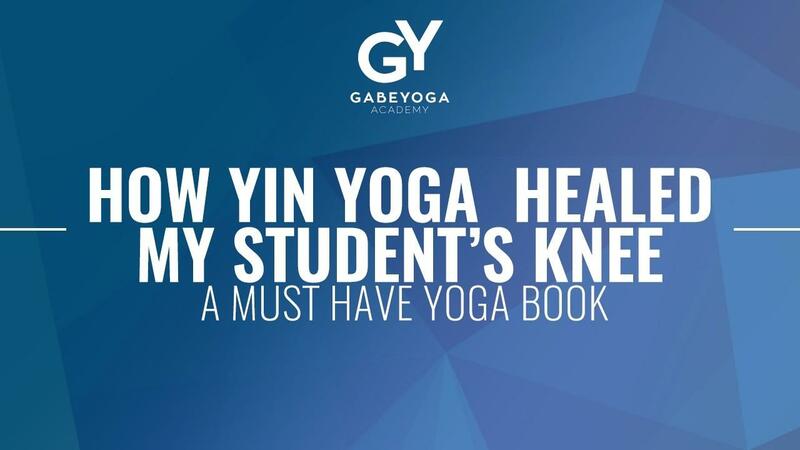 Together they wrote this book that reveals the history and philosophy behind Yin Yoga. As well as targeted sequences for Hips, Knees and Low Back. This is a must have book for students and teachers as it will make you look at the body through a clearer lens. Included with this book:- Flash cards with Sequences for Hips, Knees and Low Back. These flash cards have pose pictures on one side and insightful poetry and philosophy on the back which you can share in your classes or use to inspire your day.- Live Yin Yoga class from the beach in Thailand. This target Yin Class applies the principles from the book while enjoying the setting sun in Asia.